The Huffington Post published a graphic attacking David Cameron which has become something of an Internet meme. “One million people using food banks” – because the law has changed to make them easier to run, easier to supply and easier to advertise. Presumably people complaining about this would prefer the food banks not to exist, and their customers to go without. “Largest A&E department closure in NHS history” – because the current medical consensus is that concentrating A&E provision into fewer, but larger and better-equipped, units creates a significantly better overall outcome for patients. This is evidence-led policy, even though it may be counter-intuitive (and that’s precisely when it’s important to follow the evidence instead of public opinion). Incidentally, not that the moaning minnies will have stopped to think about it, this is simply a continuation of policy set by the previous Labour administration. “Hundreds of thousands of new insecure and zero hours jobs created” – along with hundreds of thousands of new full time and secure jobs. More jobs means more jobs of all kinds. And any job is better than no job. “Bankers’ bonuses protected” – or, to be more accurate, government not interfering in commercial contracts of employment. “Debt higher than under Labour” – which would have been the case under the current administration, whatever its colour. David Cameron never promised to reduce the debt over the lifetime of this parliament, merely to reduce the deficit. Which is under way. “Botched Royal Mail sell-off cost taxpayers £1bn” – OK, I’ll give you that one. Although that was overseen by Vince Cable, of course. “3.6 million disabled people targeted by spending cuts” – is simply a false statement. There has been no such targeting. “Introduction of the bedroom tax” – which, of course, doesn’t really exist as there is no such tax. And I personally support the real policy of reducing the cost of social housing by only paying for the space that people actually need. “Midwives strike for the first time in 133 years” – which is a good argument for banning strikes in essential health-related services. “£3bn tax cut for the top one percent of earners” – along with £billions of tax cuts for everyone else. “3.5 million children living in poverty – and expected to rise” – a figure defined in relation to median earnings, so it actually increases as the median salary rises. Which is one of the daft things about using relative measurements of poverty. 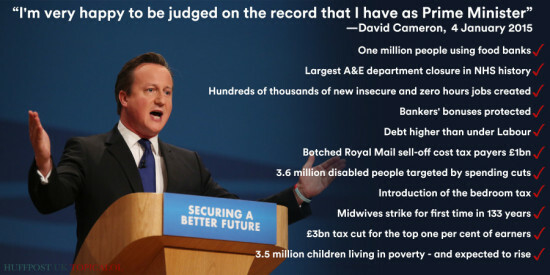 So yes, I’m happy to judge David Cameron on his record.